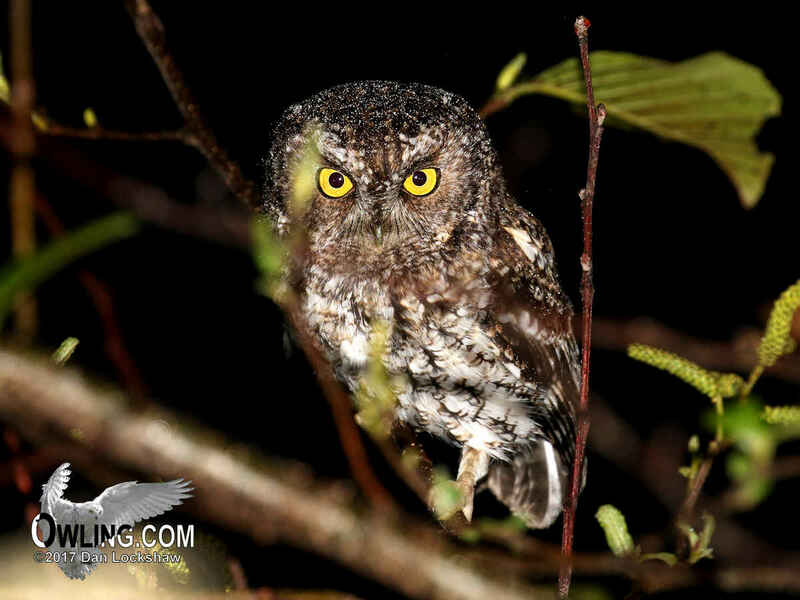 The Bearded Screech-Owl has one of the most restricted ranges in Central America. It comes in both rufous (red) and brown (gray) morphs. 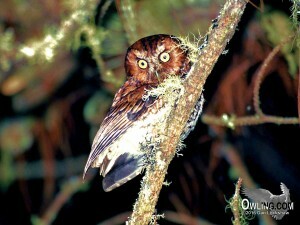 Here you can find photos and information to help identify and enjoy this beautiful owl. 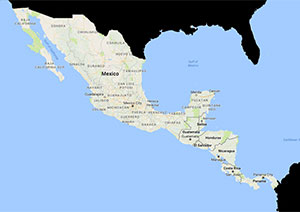 The Field Notes section includes a Central American range map and information on nesting, habitat, description and identification. 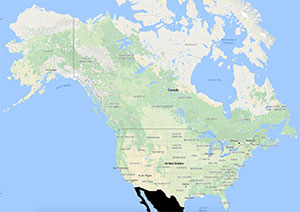 This is a commonly heard single note location call. 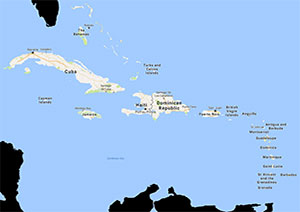 This is the primary territorial call that is most commonly heard in the field. Bearded Screech-Owl is a small screech-owl found at 5800-8100 ft. in humid pine/oak forests. It is listed as locally fairly common with a very limited range. We found this owl in very small pockets of high density. Like all screech-owls the Bearded Screech is strictly nocturnal (active only at night). 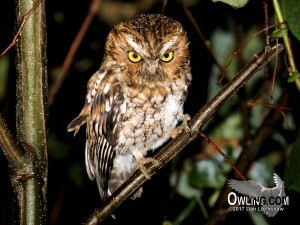 It feeds mainly on large insects although most screech-owls will probably also take some small vertebrates. 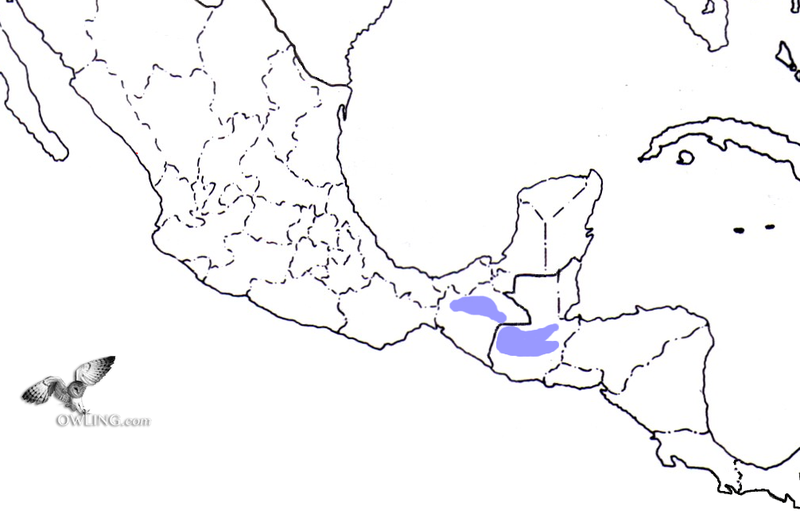 There is only one race of Bearded Screech and its range is restricted to a small region of Chiapas in Southern Mexico south into the mountains of Central Guatemala. It is a resident owl and there are no known movements other than juvenal dispersals. Although nesting is undescribed… by our photos here on Owling.com, it is clear that tree cavities are certainly a nesting possibility. Nests are believed to generally have 5 to 6 eggs. The most apparent characteristics of the Bearded Screech-Owl are first its unfeathered bright pinkish colored feet then its small ear tufts and wings that project below its short tail (clearly visible when the owl is perched). 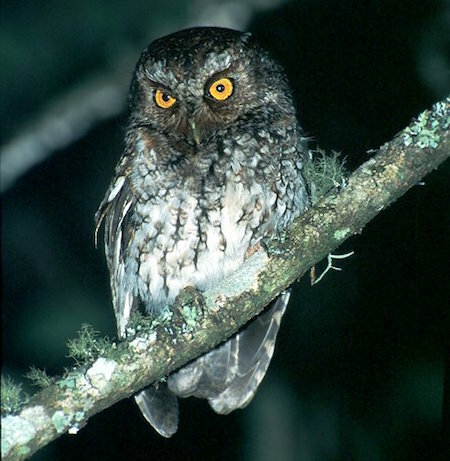 Like most screech-owls it has bright lemon yellow iris (eyes) and a yellowish to gray bill with a yellow to horn colored tip. It is a dimorphic owl meaning that it occurs in two distinct color phases, rufous and brown (the Eastern Screech is also dimorphic). 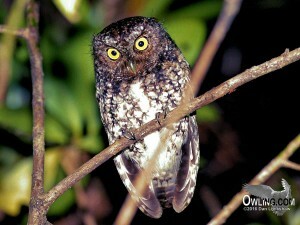 The pattern of its plumage is similar to the other screech-owls. It has a very soft “toot” or “hu” almost reminiscent of a very soft pygmy-owl call with the notes repeated at about 2-3 second intervals. This soft “hu” is very ventriloquial and can be very hard to locate. It also has a little bolder, fast 3-5 second trill that increases in volume and at times drops abruptly at the end.